The Original Footwear Chase Series Boots were intended for law enforcement personnel looking for a top of the line boot. 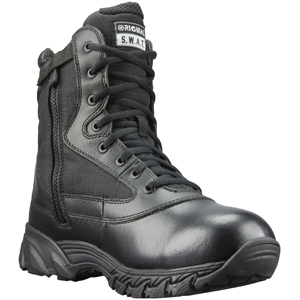 The Original SWAT Chase 9in Waterproof Side-Zip Boot 139601 features a full grain leather and 1200 denier nylon upper for improved durability and comfort. This premium boot was designed to perform under the harshest conditions while keeping you looking good. With its proven non-slip Chase outsole and its waterproof bootie construction, you can depend on this tactical boot to keep your feet dry and comfortable so you can focus on the mission. At a lightweight 44oz per pair, you won't have to worry about bulky boots slowing you down. Original Footwear included several technology measures to maximize comfort. They include a custom-molded thermoplastic heel counter and toe box for instant comfort and lateral support. A Texon stability platform and Poron performance cushioning pads to absorb shock. This boot has an airport friendly nylon shank for foot support and is safe for use around x-ray equipment.